Interim President Susan Martin and Provost Andy Feinstein participated in a Student Media News Conference Oct. 26. During the one-hour news conference, the administrators fielded questions from Journalism and Mass Communications students involved in campus news organizations including Update News, the Spartan Daily and Equal Time. Students involved in the Update News broadcast ask questions of SJSU’s president and provost at a news conference. 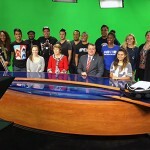 President Susan Martin, second from the left in the front row, and Provost Andy Feinstein, second from the right in the first row, pose for a photo with student journalists Oct. 26. 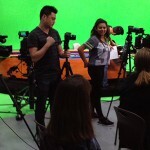 Held once a semester, the conference allows student journalists to practice their interview skills with high-level administrators. Students took the opportunity to ask questions ranging from what plans are in place to keep the campus safe given recent shooting incidents at other universities to what building plans are next for the campus, specifically in terms of academic spaces. The event was coordinated by Associate Professor Diana Guerrazzi and Pat Harris, the media relations director for the university. The conference ended on a light-hearted note when one of the final questions posed asked Martin and Feinstein what they think is the most important thing students should do before they graduate. Martin spent her first weeks as president living in campus housing, where she interacted with students frequently.